Whatever your job is, chances are you find it hard to switch off. Today, we work longer hours, at weekends, at home and on the move - while the office is only ever a click away via smartphones and the Internet. But as much as we assume that this is the price of success - it doesn't have to be this way. 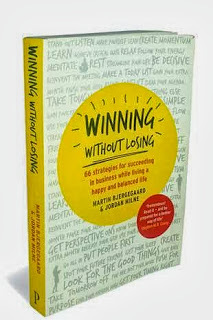 Martin Bjergegaard and Jordan Milne are here to show you how to build your business into something big, sustainable and widely recognized - and still lead a happy, whole and balanced life. Martin Bjergegaard worked for McKinsey & Cobefore becoming one of the co-founders of Rainmaking. Along with his co-founders, built a portfolio of 8 startups with a total of 50 million dollars in annual revenue, 100 employees, and offices in London, Copenhagen and Munich. Jordan Milne is a respected Canadian entrepreneur and writer and a contributing editor at NYC-based financial magazine AiCIO As a member of The Sandbox Network; the foremost global community of extraordinary young achievers below 30, he helps aspiring young leaders accomplish their goals.